BACKTOFRANKBLACK.COM: Carter/Spotnitz signing in LA next month! Competition Revealed! Carter/Spotnitz signing in LA next month! Competition Revealed! 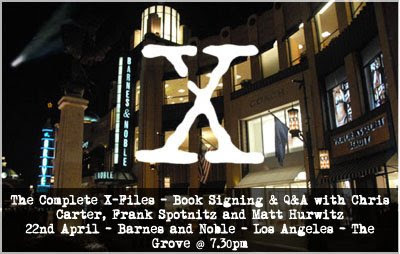 Chris Carter and Frank Spotnitz will be joined by author Matt Hurwitz to promote the book "The Complete X-Files: A guide to the Myth and the Movies" in a book signing event on the 22nd April at 7.30pm at Barnes and Noble, The Grove, Los Angeles. This will be a great event for any fan of 1013's productions - and to add a Milleniumistic slant for our wonderful BacktoFrankBlack followers, we've been hoping to arrange for one of Millennium's cast to be popping down! We'll update you on that as we get nearer to the event! If you are in the area we heartily recommend you join the chorus and support our 1013 brothers and sisters. We've also been part of the process of getting some media coverage so hopefully we can report anything that is said at the event in regards to Frank Black and Millennium! More on that when more is confirmed! To celebrate this event we have an upcoming competition to be announced on Friday. We will be giving away two of "The Complete X-Files: A guide to the Myth and the Movies"! The two pristine sealed copies have arrived from the States courtesy of Palace Press Publishing and it is a great X-Files tome! So what's the competition? We'll reveal it on Friday which we hope we be fun for all those who taking part! Keep your eyes on the blog - this is a great promotional event and BacktoFrankBlack is proud to be part of the promotions. Please spread the word and show your support. If you live near LA or intend to go to this event please let us know! We'd love to hear from you! Contact us at info@backtofrankblack.com! 1 Response to "Carter/Spotnitz signing in LA next month! Competition Revealed!" Sadly I cannot make the Q&A but it sounds like a very exciting event. Here's hoping you guys can fill us in with all the latest from the proceedings. I will certainly enter your competition and looking forward to seeing what it entails. Nice to see you guys getting some goodies to play with and great for your supporters as well.